Savotta of Finland makes some of the worlds best backpacks and the Savotta 50 Expedition pack is a superb example of their work. Tough and robust, its built around a traditional pipe frame, renowned for its strength and loved by the Finns!, it then has all the modern features engineered around this, to give you the best of both worlds. Made to accept heavy loads, its also adaptable for lighter loading and includes a huge array of features to aid load carry and make a efficeient Endeavour of your kit storage, accessability and mobility. A proper, flexible expedition backpack based on traditional, reliable, experience. Made in Finland! The celebration rucksack of the 50-year journey of Finn-Savotta. The comfort of carrying and use, in particular, has been considered in the design of this model, without forgetting traditional Finnish quality. This reliable camping rucksack built around a traditional pipe frame but equipped with modern details is suitable for hard use, just like its predecessors. The most obvious new features compared to older rucksack models are the more streamlined, sleeker design, the quick and easy to use buckles and the better padded shoulder straps and hip belt. A traditional external frame backpack is at its best with a heavy load but is equally suitable for lighter outings as well. The external pipe frame allows air circulation between the bag and the back of the user, reducing the heat load significantly. Although anatomical rucksacks have taken over some turf in the rucksack market, there are still situations where nothing beats an external frame backpack. The top compartment of the bag (dimensions approximately 45 x 32 x 25 cm) is closed by tightening the drawstring opening which is secured with a waterproof protective collar which enables overpacking as well. The opening is covered with a generously sized flap which is secured with straps. The quick-release fasteners of the straps can be opened and closed fast also while wearing gloves and are very easy to tighten as well. The generous length of the straps provides a lot of space under the flap for overpacking. The contents of the top compartment can be accessed quickly through a vertical zipper that runs along the full height of the compartment. The top and bottom compartments of the bag are separated by a built-in divider. The flap of the top compartment has a flat pocket for small items (dimensions approximately 20 x 30 cm) and there is a small pocket for valuables inside the top compartment against the back (dimensions approximately 15 x 27 cm). The flap of the bottom compartment (dimensions approximately 42 x 32 x 30 cm) of the bag is closed with a two-way zipper which is secured with two straps. The straps are fastened with plastic buckles. The weight of the load rests on the straps, reducing the strain on the zipper. 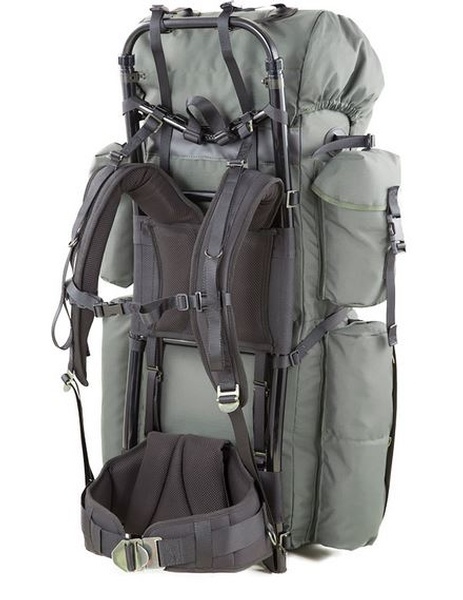 With these straps, gear can also be attached to the bottom of the rucksack. The bottom has a flat pocket (dimensions approximately 30 x 25 cm) on the outside suitable for packing a rain cover, for example. The upper side pockets (dimensions approximately 23 x 10 x 8 cm) are closed by tightening the waterproof protective collar which is covered with a flap that can be secured with buckled straps. The upper side pocket on the right side is also equipped with a side zipper through which the contents can be accessed quickly. The lower side pockets (dimensions approximately 38 x 10 x 8 cm) are closed with zippers that span the whole side. The left lower side pocket has been divided into two compartments with a horizontal divider. The pocket on the right side consists of one large space with no compartments. There are attachment points for detachable straps on top of the bag. The straps are wound around the upper curve of the frame, ensuring stable fastening with no swaying around even for heavier loads. 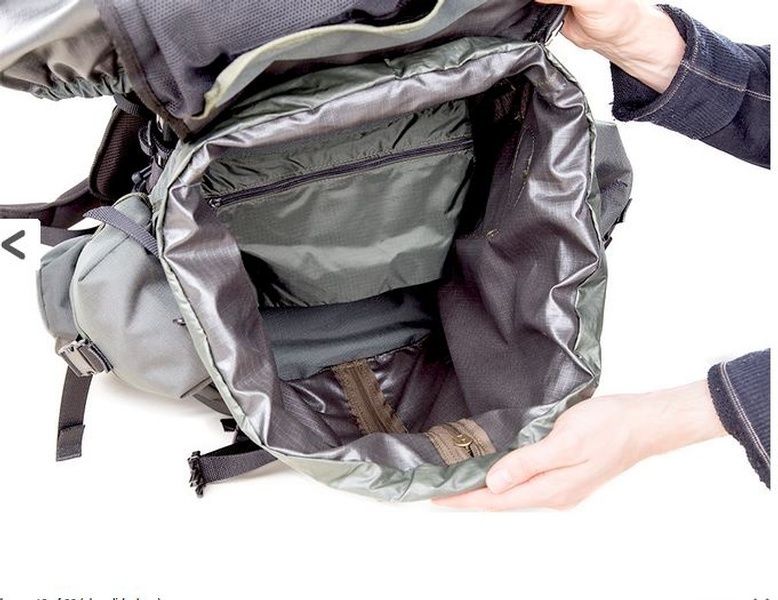 and other long, narrow supplies can be carried behind the tunnel-shaped side pockets. 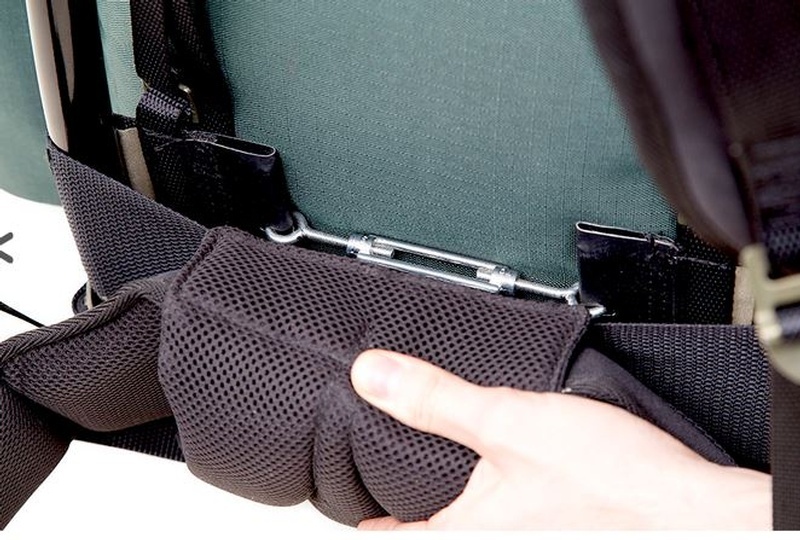 The attachment points with straps above the side pockets secure the attachment of the supplies. The frame of the carrying system is a strong aluminium pipe frame. The upper curve of the frame is detachable and its height can be adjusted continuously. The upper curve enables the stable attachment of supplies of different sizes on top of the bag. The shoulder straps and hip belt covered with breathable netted fabric on the body side are well-padded and anatomically shaped. In addition, the lower back is supported by a separate, thick padding pillow. The buckle of the hip belt can be undone very quickly with one hand, a very valuable feature in a possible emergency situation. The buckled chest strap provides extra comfort and support for carrying. External dimensions: height 90 cm, width 50 cm, depth 35 cm. Materials: Rip-stop reinforced PUR polyester, polyester strap, Delrin special plastic buckles and Kroko zippers. Colour: olive green with black straps. Purchase through PayPal by using the "Add To Cart" button above or use the form below to order the Savotta Finnish Expedition Backpack 90L . 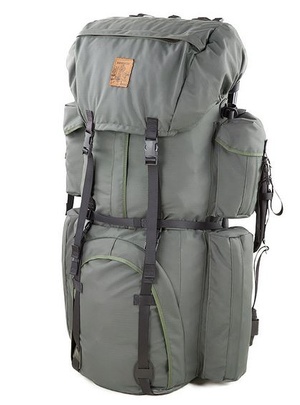 Feel free to contact us if you have any questions about the Savotta Finnish Expedition Backpack 90L .